Mollie Moran is one of the few people alive today who can recall working 'downstairs' in the early 1930s before the outbreak of World War II. 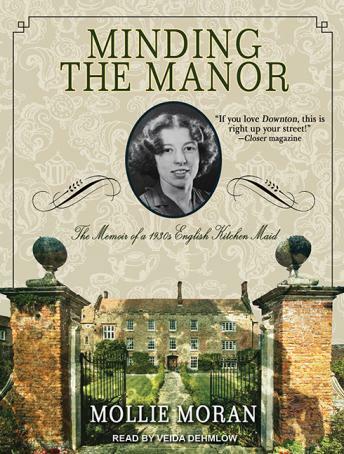 In Minding the Manor, she provides a rare and fascinating insight into a world that has long since vanished. Mollie left school at age fourteen and became a scullery maid for a wealthy gentleman with a mansion house in London's Knightsbridge and a Tudor manor in Norfolk. Even though her days were long and grueling and included such endless tasks as polishing doorknobs, scrubbing steps, and helping with all of the food prep in the kitchen, Mollie enjoyed her freedom and had a rich life. Like any bright-eyed teenager, Mollie also spent her days daydreaming about boys, dresses, and dances. She cherished her friendship with Flo, the kitchen maid, dated a sweet farmhand, and became secretly involved with a brooding and temperamental footman. Molly eventually rose to kitchen maid and then became cook for the Earl of Leicester's niece at the magnificent Wallington Hall.